Let’s face it, when it comes to New Years Resolutions, we all have really great intentions starting out with lots of energy and will to achieve them. However, for many of us (me included), it’s hard to maintain that enthusiasm and consistency needed to achieve them. And for others the vision for what we want to achieve may not be quite clear enough to crystallize into actionable steps. Thankfully, Gary Young had that vision for us and created some truly amazing blends to help keep us (and our horses) on track and reach our goals. People often ask me “How do I use ‘this’ or ‘that’ oil for my horse?” “What oils do I use to help my unmotivated pokey horse put a little energy into things?” Well the answer for that is the same as you would when it comes to aromatherapy. The very same oils that YOU would use on yourself for a particular thing, work the same for your horse or other animals. The only difference is sometimes it’s not practical to run your diffuser in the barn, or the application location may need to shift a bit for anatomical reasons. Horses and other animals are also much more sensitive and “in-tune” then we humans are. So a little goes a REALLY long way! 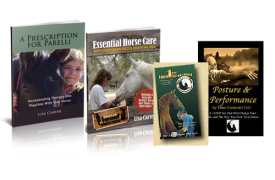 When it comes to essential oil safety, you want to make sure you ALWAYS check with your veterinarian to make sure your horse does not have any pre-existing condition, or is taking any medications, that would be contraindicated for a particular oil. There are so many variables there that there is no way that I would be able to give you a comprehensive list. 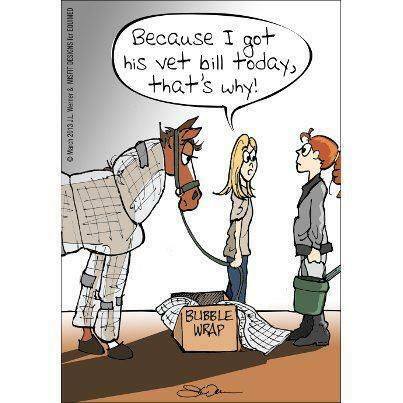 You will just need to do your due diligence and know your horse’s medical background for you to do your research on that. A good Essential Oil Desk Reference will go a long way in help you identify these things and work with your vet. And of course, anything that I mention as far as usage/benefits applies strictly to Young Living essential oils. I know without a doubt that they are safe and unadulterated and safe to use on animals. I have been using them for many years, as have tens of thousands of other members. The reason we hear so many horror stories with animals and essential oils is because of the wide availability and misuse of cheap, adulterated, perfume grade oils that people think are pure and safe. They are not, most are garbage, particularly if you get them at the grocery store! 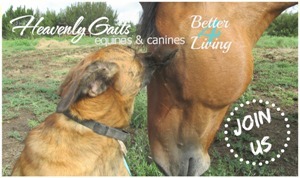 I do an entire Essential Oil 101 class for horses and other animals that you can attend. Check my Events for my upcoming class schedule to attend one of these free online classes if you are interested in learning more. 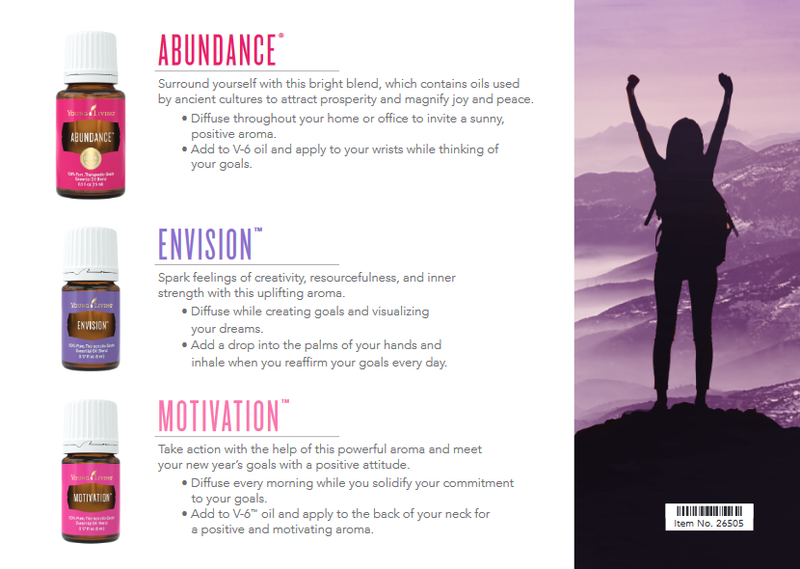 Step 1: Envision – Envision™ contains scents that stimulate feelings of creativity and resourcefulness, encouraging renewed faith in the future and the strength necessary to achieve your dreams. It includes Safe, Geranium, Orange, Rose, Lavender and Spruce. Enjoying Envision’s aroma can help you visualize your goals and provide greater focus. For horses and other animals it can be used for animals who may need to overcome fears and/or become more independent from their human/herd/pack. Motivation – Diffusing Motivation can help solidify your commitment to your New Year’s goals. The powerful scent of Motivation™ may promote feelings of action and accomplishment when diffused. This blend contains the oils of Roman Chamomile, Spruce, Ylang Ylang and Lavender. This blend is perfect for horses that need a little motivation during your training sessions or activities and/or that need to overcome feelings of fear. 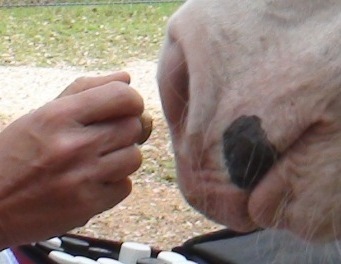 Add a drop into your palms, rub them together and then pet your horse over the brain stem area (poll). 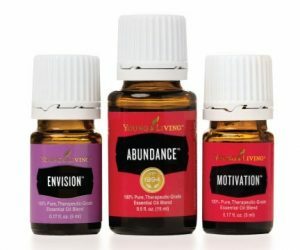 Abundance – This is absolutely one of my favorite oils of all time. I use it daily. Abundance™ combines oils such as Orange and Ginger, which were used by ancient cultures to attract prosperity and magnify joy and peace. Other oils included are Myrrh, Cinnamon Bark, Frankincense, Patchouli, Clove and Spruce. Adding Abundance to V-6™ oil and applying to your wrists can promote a positive environment and openness to receiving prosperity. For animals that scarf their food down or are obsessive about food or toys, perhaps have the feeling that they never have enough, this is the blend you want to offer. Add to V-6 carrier oil and apply to your wrists while thinking of your goals. Massage a drop into the hollow at the base of your horse’s pasterns, between the heel bulbs of the front feet. New year, new you! If you’ve made a New Year’s resolution to become your best self this year, trying the new Young living ResOILution Kit should be next on your 2019 to-do list. This collection of essential oil blends contains scents that can help set the stage for your most successful year yet! Now through January 31, 2019, you can get all three of these oils in this Limited Edition discounted collection! While you’re pushing through boundaries to be your best self, you can also help those in need. Five percent of all proceeds from the sale of this ResOILution Kit will benefit The D. Gary Young, Young Living Foundation.